The joy and beauty of Shabbat came to life at Hebrew School this week. Children prepared for Shabbat, sang Shabbat songs, studied the blessings for candle lighting and Kiddush, and made Shabbat items to "bring Shabbat home". Shabbat, this special day G-d has to given to us, we will cherish and celebrate. Amidst the great evil and darkness we have endured this past Shabbat, we will continue even stronger, with adding more and more light and goodness to this world! Hebrew School learning and fun! Jewish music and movement, Alef Bet activities, acting out the story of Joseph and his brothers, learning all about kosher, and discussions about our Neshama. 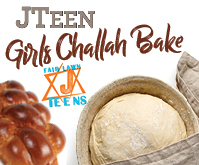 What a beautiful evening as the Jteen girls joined for the special mitzvah of making challah, prayed for those who need a blessing fore health, enjoyed a fun auction and salad bar, and made an extra challah to gift to seniors! A day at Hebrew School, where Judaism comes alive, as children sing prayers, study Hebrew reading and writing, embrace our rich Jewish history and traditions, engage in the practical mitzvot, the hows and whys, and discuss fundamental Jewish concepts! October has arrived! Turn the calendar page and check out what is coming up this month! Thank you to our September calendar sponsors: Michael Gutnikov, Gary I. Gorodokin, Nad's Hair Studio, Julia Starobinets - DDS of Bright Smiles Orthodontics, Zohar "Zack" Zamir of the ZAMIR GROUP, and ABA Insurance Agency.